This is the 1861 second edition of Matthew Fontaine Maury’s important wall map of the United States, published by simultaneously by Joseph Taintor of Philadelphia and Holmes Harrison of London. This map covers the entirety of the United States as well as adjacent parts of Canada, Mexico, and the West Indies. Maury, the original cartographer who published this map in 1860, was a Confederate and, at the outbreak of the Civil War in 1861, left his government post with the National Observatory to join the southern uprising. Consequently, many of Maury’s original embellishments, including a portrait of cartographer himself, were removed in this 1861 edition to be replaced with vignettes of the U.S. Capitol and Mount Vernon – as depicted. Between Mt. Vernon and the Capitol there is a map of the world on a hemisphere projection, with comparative charts of the world’s great mountains and waterfalls to either side. Left and right margins feature medallion busts of the U.S. Presidents. Inset demographic maps are Hitchcock's Geologic map of the U.S., Loren Blodget's map of the annual rainfall and Traill Green's zoology map. Above the title is a vignette of the Washington Monument and above, the table of air-line distances between various cities. Along bottom is a vignette view of New York, a table of the 1860 U.S. Census, and a large inset demographic map showing agricultural staples and distribution of plants. At left, above the inset maps, are details regarding religious denominations in the United States. Cartographically this map is derived from a combination of U.S. Coast and Land Survey maps as well as earlier maps of the United States. As Superintendent of the National Observatory, Maury had access to all of the most up to date cartographic work compiled by the U.S. Government. Maury’s treatment of the Transmississippi region is particularly noteworthy with a post-Colorado (1860) and pre-Arizona-Wyoming-Idaho-Montana configuration. The explorations of Beckwith and others associated with the proposed transcontinental railroad, including Northern Pacific and Central routes, are noted. Also noted is the Pony Express Route, and various emigrant and wagon routes between the Mississippi River valley and various west coast cities. The Colorado silver mining region is also identified. 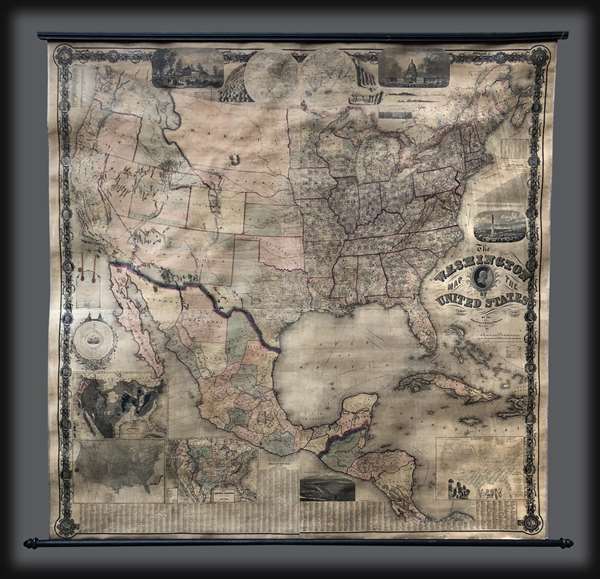 In all this is a rare map of the United States and the only Civil War Era wall map to be issued by the United States government.